The small town of Pai is nestled in a valley in the province of Mae Hong Son to the north-west of Chiang Mai. Although it looks close on the map, getting to Pai by bus from Chiang Mai is a slow journey up and down twisting mountain roads that takes around four hours. Being tucked away in a relatively remote, rural location has meant that, in the past, Pai has been able to keep a low profile and was only on the radar of more adventurous travellers or those in the know. That’s all changed though, particularly with Pai and the surrounding countryside featuring in two popular Thai movies in 2004 and 2006 which resulted in a boom in local tourists. Pai still retains its reputation as being a hangout for Bohemian travellers, but whilst you may see wannabe-Rastas and barefoot backpackers you are equally as likely to be rubbing shoulders with hi-so Thais posing for photos outside coffee shops and other locations from the movies. 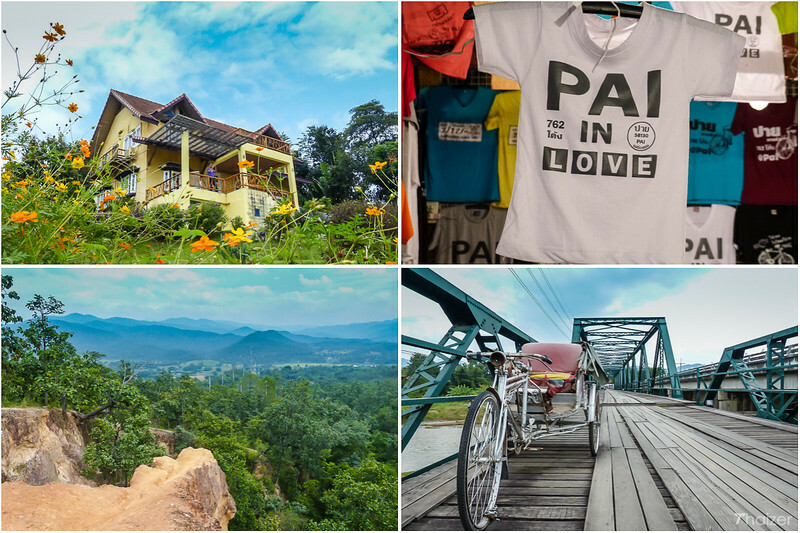 The budget backpacker has always been well catered for in Pai, but now there are also good options for flashpackers or those who want a few more home comforts or a bit of boutique style. Pai is small enough to explore on foot, but to venture further afield you could hire a bicycle or motorbike. The temple at Wat Mae Yan just outside of the town sits on top of a hill and provides fine views of the surrounding countryside as does Pai Canyon located around 8kms out of town. If you are looking to do something active with your time, there are a number of tour operators and guest-houses in Pai that can arrange trekking, bamboo rafting or visits to an elephant camp. There are no direct routes to Pai from Bangkok. The gateway to Pai for the vast majority of visitors is via Chiang Mai. The quickest and most expensive option from Chiang Mai to Pai is the 30-minute flight with Kan Airlines. At the other end of the scale, the cheapest and slowest option is the ordinary local bus between Chiang Mai and Pai which is also used by some of the local Hill Tribe people travelling to locations between Pai and Chiang Mai. A few Baht more will give you more comfort, air-conditioning and more speed in one of the mini-buses that ply the route. Kan Air suspended all their services in the first half of 2017.